There comes a time for every gardener when the unusual plant is simply irresistible. The magic lily promises flowers without leaves and the Joseph’s coat rose promises roses of many colors on one bush. One of the most striking effects, though, has to be the tree with red leaves. Although only a few red-leaved maples are actually Acer rubrum, these native trees give American gardeners a place to start looking. Most members of the Acer rubrum family, called red maples, have green leaves throughout the summer and are named for their brilliant fall foliage. They are natives of North America. Male trees display soft red to pink leaves and red flowers as buds open in spring. Female trees have reddish seeds, known to children as helicopters, in spring. Most red maple leaves have reddish stems. Red Sunset and Crimson King varietals maintain their red coloring longer than others in spring. 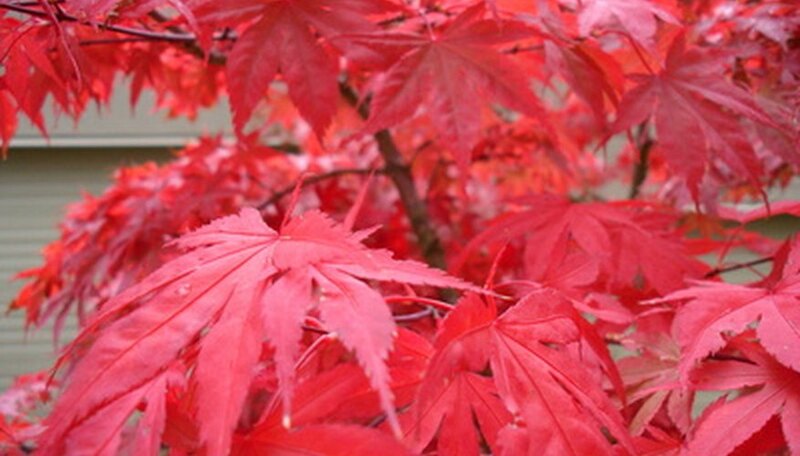 Acer palmatum, the Japanese maple family, contains dozens of hybrids that have red or red-tinged leaves during all or most of the growing season. 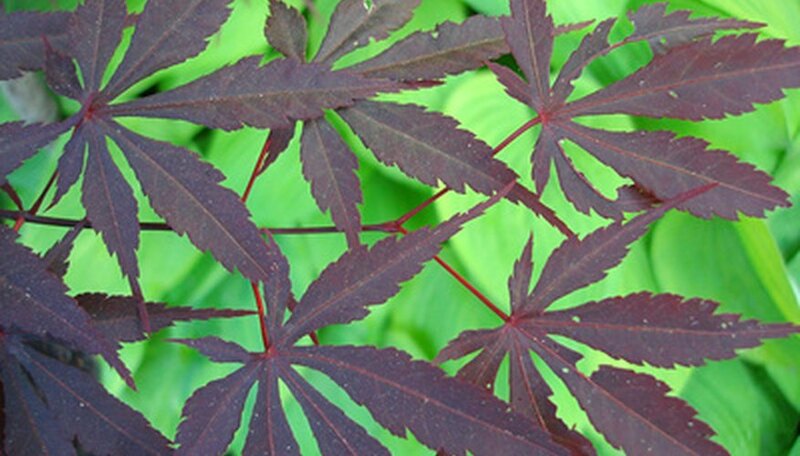 Japanese maples leaf out red in the spring but many varieties turn green, yellow or bronze in summer. This extensive and diverse family has been the subject of hybridization for centuries and is widely used for bonsai. Dozens of varieties, however, remain red or edged with red, turning purple through summer; most revert to bright reds in fall. 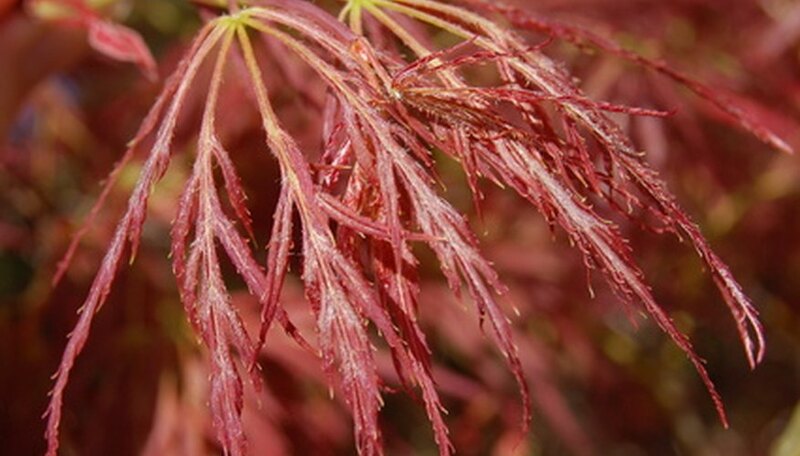 Georgia’s Maple Ridge Nursery lists 11 laceleaf, or dissectum, Japanese maples, including Crimson Queen, Red Dragon and Red Filigree Lace. The Nursery offers nearly two dozen upright Japanese maples including Bloodgood, Oshio Beni and Bonfire. Several linearlobum varieties are listed; Atrolineare and Beni Otake display red leaves all summer. Wildwood Farm in California lists dozens of dwarf and semi-dwarf Japanese maples; red-leaved varieties include Beni family hybrids, Hubb’s Red Willow, Shaina and Umegae. Two other types of maples lend red accents to the garden. Wildwood Farms lists the Asian Acer shirasawanum species Autumn Moon and Red Dawn. Both have leaves of solid orange, red or colored edges throughout the growing season. A variety of Acer platanoides or Norway maple, named the Royal Red Maple, also has dark red-purple leaves. The use of Norway maples is discouraged in many areas because they crowd out native maples.